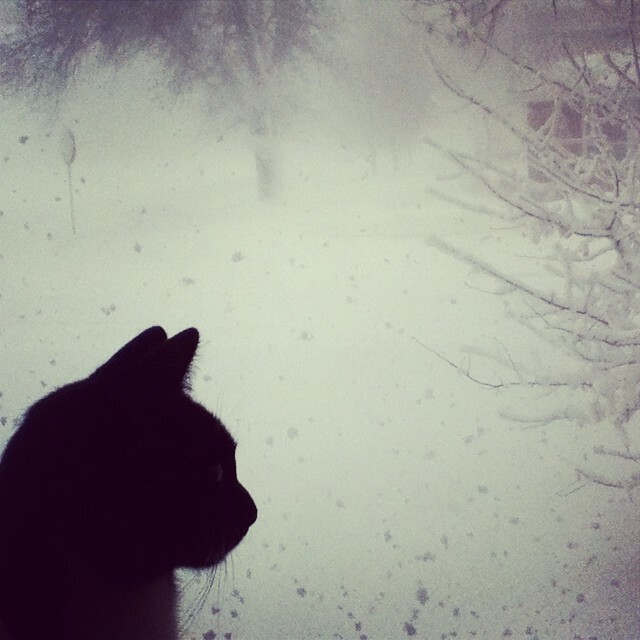 We’ve been snowed in for two days with a winter blizzard that’s led to closed highways and canceled plans. While I’ll be awfully tired of this business in a month or two, I kind of like this part of Minnesota winters for now. We’re forced to slow down, stay home and do cozy things like read, play games and bake. I take long baths and browse seed catalogs to plan my spring and summer gardens. I use up apples, pears, berries and pumpkin puree that we put up last summer and fall in homemade muffins and gluten free mix and match snack cakes. We watch silly British math shows. The kids have tickle fights and show each other funny videos. We picked up this geography game for 99 cents at a thrift store and finally got around to playing it yesterday. It was quite old and exceptionally well made, and luckily every piece was still there. It led to quite a lot of great learning about geography and history for Jack, Victoria and even me. 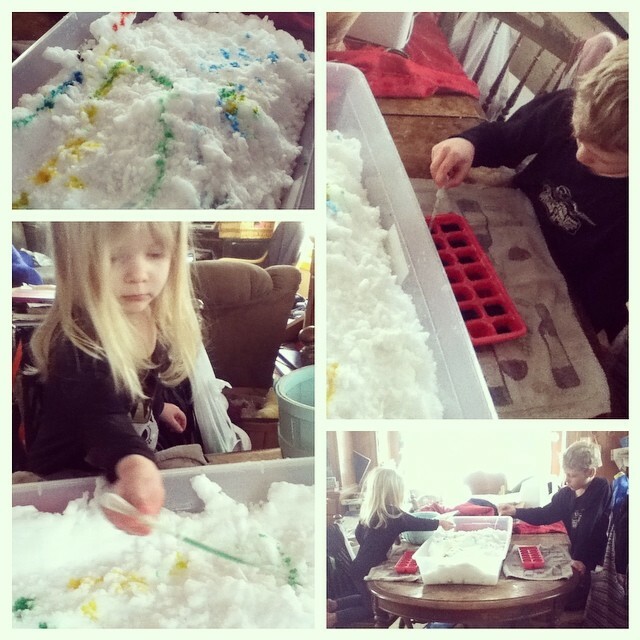 This morning, I set the little ones up with a giant bin of snow and ice cube trays of colored water. They had so much fun mixing colors and experimenting with making tunnels with water. 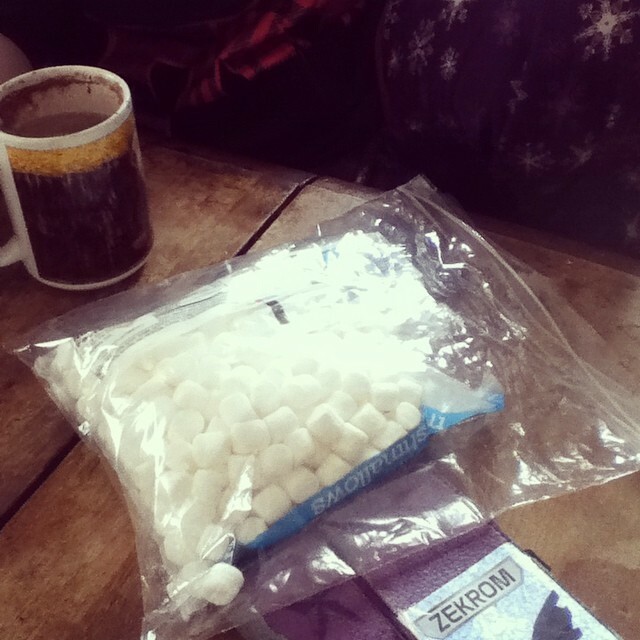 Later, Victoria did marshmallow homeschool with Jack, Fiona and Alex while they warmed up with hot cocoa after shoveling the driveway. She asked them questions related to math, social studies and spelling for them to earn marshmallows (examples for Jack: What’s the difference between a slave and an indentured servant? If 4x + 4 = 20, what is x?). She googled questions for various grades in order to come up with good questions. My kids always love doing marshmallow or chocolate chip homeschool. Afterwards, Jack asked me to do more algebra with him (no treats involved). This entry was posted in crafts, Daily log, Fun, games, geography, history, homesteading, magical moments, math, pictures, Preschool, recipes, social studies, spelling by Alicia. Bookmark the permalink. Omgosh! Thank you for the reminder. I have this game packed away still. I found it at a thrift store for $1.00 also. 🙂 I will be pulling it out and setting it up this afternoon. I hope my girls enjoy it. I’m so surprised anybody else has it. It seems so old and I’d never heard of it. It is a fun rainy/snowy afternoon game. We all helped each other and just played until we felt like moving on (maybe an hour? ), which I think helps my kids enjoy games more despite the different ages and knowledge levels. That’s how we play Bananagrams too, which is one of our favorite spelling/vocabulary games. Hope you like it! I’d never heard of it either. We tried it out last night and really enjoyed the game. An hour was good enough for us. We do the same thing with games. Following the instructions is good but letting the girls have free reign on how they play games is way more interesting. I love to see what they come up with. I owned that game as a kid and loved it! I wonder how it aged with all of the changes politically, etc. I bet my parents still have it in their basement 😀 My oldest is only 3.5 but I just found your blog and have been slowly reading (I’m still in 2008!) Thank you so much for sharing your life with us!